The Sunday Evening concerts in San Francisco in question were sponsored by Standard Oil and had a rather limiting proviso. There would be no advertisements but in return no single work was to last longer than twenty minutes in length. This was pretty strictly adhered to. The Franck Symphony proves to be an exception but excellent note writer Arthur Bloomfield suggests it may have been a birthday present from the sponsor (Monteux was then seventy-one). As for Beethoven's Fifth, that is a composite performance comprising movements taped three years apart. The survival of these discs is fortuitous, not least in assembling a goodly amount of otherwise unrecorded Monteux material. He is on fractionally more intense form - sometimes considerably more intense form - than in his commercial recording of the same work, insofar as comparison allows. The sound is generally unproblematic. The recordings seem to have been made on acetate discs and the surface noise is usually unobtrusive. Some of the earlier material is in rather dim sound but despite some muddied frequencies here and there these are really excellently preserved archive recordings and, with Monteux in charge, deserving of the widest possible recommendation. There are over twelve hours of music-making here so I will only begin to scratch the proverbial surface but hope by doing so to show the weight of Monteux's achievement, his endless trouble to secure sonorous clarity, and the generally idiomatic and affirmatory nature of his conducting. The first disc is devoted to Beethoven; an elegant and precise Consecration of the House Overture, not recorded commercially, followed by a problematic performance of the Fifth Symphony. It's problematic not just for the reasons noted above - it's a composite - but also because of the tough and unattractively driving persistence Monteux adopts in the opening movement. There's a little untidiness orchestrally - and in the conception as well - even though the slow movement really is con moto and sharply etched and the Allegro third movement commanding. In the finale the balance favours the brass over the strings and again it's powerfully and insistently, but in the end not very convincingly, done. The Prometheus adagio allows us to hear some of the orchestral principals and most attractively they phrase as well, whilst Egmont receives a reading full of acute sensitivity and finesse. From the rising wind figure and powerful trumpet line this is a performance of style and finesse. It's also flexible and deigns to rush in that prosaic crowd-pleasing way, whilst exposing inner part writing with a degree of transparency that was one of Monteux's hallmarks as a conductor. He builds to the climax with powerful ascents and strong accents but nothing is inflammatory or needlessly outsize in scale. Leonore is in somewhat more constricted sound, unusually since this dates from 1952. There a few trivial sounding scuffs on the acetates - otherwise a good performance in moderate to good sound. The second disc is mainly Mozart and Haydn, with a little Gluck for good measure (and these discs are notably good measure interpretatively and also in terms of timing). I wasn't really taken by the Don Giovanni overture; it seemed a bit soft and loose - but the Haffner Symphony that follows is a different thing altogether. Ebullient, vivacious and in somewhat constricted sound once again this is a most impressive performance and a compound of sensitivity and robustness. The Andante is taken at a fine tempo, with crisp accenting and legato phrasing and subtle affection informs the Presto finale notable for ringing percussion and a strong forward motion. We have a tantalising torso of K414 with William Kapell as soloist, the only soloist in fact in this set of discs. Arthur Bloomfield likes the two movements rather more than I do. The tempo is leisurely in the Andante, Monteux's shading expert and whilst Kapell is reasonably fluent, his cadenza strikes me as unduly aggressive and the Allegretto only so-so. I did like the graceful clarity of the Die Zauberflöte overture - it's not freighted with Masonic gloom - and whilst the sound in the overture to Die Entführung aus dem Serail is nothing special (it dates from 1945) it's rather held back, it is also very stylish. Monteux brings discerning nobility to the Gluck, the San Francisco orchestra phrasing with elegance, and in Haydn's Symphony No 88, he is commandingly robust with the horns, encourages some rather individual wind fillips in the Largo and presides over a most sensitive Minuet and trio. It's remarkable to think that Monteux recorded so little Strauss because on this showing he's absolutely first rate. In fact only Ein Heldenleben and Tod und Verklärung were commercially recorded and the latter was released posthumously. Don Juan is passionate and eager, flexible and intensely poetic - try the oboe's passages - all the while maintaining superb clarity. Tod und Verklärung is equally discerningly conducted. It's considerably quicker than his much later 1960 commercial disc and also more intense and dramatic. Til Eulenspiegel is not conventionally quick but is full of vibrant colour, played up for all its considerable extravagance will allow and suffused in playfulness. The Rosenkavalier Suite is beautifully modulated, rhythmically acute and has a degree of elegance in the string pointing. As with Strauss, so with Wagner. Monteux was tagged a French specialist - he resigned from the Met because Rudolf Bing refused to let him conduct German repertoire - and so the world didn't clamour to hear his Wagner. Precious little was committed to disc so once again these are valuable survivals. The Parsifal extracts are powerful, strong on solemnity but not portentousness, with some marvellously hieratic brass and prayerful strings. Monteux brings out, as few others do, the yearning inner voices (he was of course a violist) but his Parsifal is a cooler affair than the central Europeans, the woodwind textures delineated with the utmost clarity and skill. The Prelude to Act I of Die Meistersinger von Nürnberg is grand but as ever with Monteux textually aerated, the winds chattering with vocality and Monteux broadening marvellously into the peroration. The Overture to Die Fliegende Holländer is bold and driven but not without some sensitive phrasing along the way whilst the eloquence and plangent depths of the Tristan Prelude and Liebestod are obvious without in any way cloying into sentimentality. The fifth CD is more Wagner and some Liszt. The winds take on the role of baritone soloist in Wotan's Farewell and the Magic Fire Music. The undoubted grandeur of these extracts never becomes saturated; strings are plangent, textures are clear, harmonic implications unclothed. The avian enchantment of the Forest Murmurs from Siegfried is delicious whilst Monteux cultivates great depth in Siegfried's Rhine Journey. I even liked the Rienzi overture - so full of earnest phrasing, yearning middle voices, noble and jaunty, and no hint of vulgarity. His Liszt is of a piece with his Wagner; Les Préludes has suspensions of great charm and elegance as well as sharply etched lines and a panoply of orchestral nuance and the Hungarian Rhapsody builds up a head of steam with its chattering drive intact. When we arrive at Berlioz we reach a Monteux specialty and he doesn't disappoint though the repertoire is a little disparate. The Carnaval Romain overture is good, despite a few little scratches, and the sound is noticeably forward but it's not quite in the Beecham class. The extracts from L'Enfance du Christ are beautifully moulded, the first flautist especially eloquent. The Damnation of Faust extracts are, despite the colour, the wit and the bite, desperately in need of being aurally "opened up". This is a boxy recording and it could do with some air. The longest extract here is from Romeo and Juliet taken from the same concert as the Damnation of Faust and features an absolutely delicious Fête at the Capulets as well as sovereign articulacy generally. The Corsair Overture ends the Berlioz disc - exciting, tremendous sense of the spaces between the notes and a superbly judged peroration. After an entertaining Fingal's Cave we are plunged into a fast and furious first movement of Mendelssohn's Italian Symphony. It just so happens that I've been listening for review purposes to Beecham's commercial CBS recording made at around the same time that Monteux was recorded here and can only say that Beecham sounds like sanity itself after Monteux. I once heard a live Cantelli recording and that was even more absurd. Unfortunately the Monteux never really recovers - lack of room for proper articulation with the relaxation into the slower sections sounding forced and sectional not organic. The slow movement sounds unsettled, stern and unyielding and the moderato third movement lax. Even the kinetic power and intensity of the finale can't save a performance that seems entirely badly judged. We are on much better ground when we move to the splendid account of Tchaikovsky's Romeo and Juliet. This is a moving and eloquent performance. I can perhaps imagine some of the entry points being better executed and indeed perhaps better prepared but in the context the wholehearted abandon is a marvel. Sectional discipline is tight, Monteux once more showing us his rhythmic flair, colour and instinct for pathos tempered by nobility and elevation of utterance. The Eighth CD is a bits and pieces affair and no less entertaining for all that. The Rossini gets a fizzing and high spirited reading, beautifully balanced and subtle. He shows once more how cogent and noble a Brahmsian he was with a fine performance of the first movement (only) of the First Symphony; he's sheerly delightful in Thomas's Mignon Overture, waggish in the Dukas. He approaches the Messiaen with just the right weight of brassiness. His Sibelius Valse Triste is unusually spectral but the Brahms Tragic Overture is stern and powerful. More lollipops and charmers attend the ninth disc. The Borodin is Beecham territory once again and Monteux scores highly for delicacy and restraint, whilst verdant is a not inappropriate adjective for his Rimsky Christmas Eve Suite. I quite enjoyed the Russian Easter Overture though the solo violin (Naoum Blinder, otherwise excellent) is strangely fallible here. Elsewhere the strings are on top, appropriately slick form for the Capriccio Espagnol whilst the sun flecked and romantic Glazunov ballet is liltingly done by the one time conductor of the Ballets Russe. There are only two movements here of Rachmaninov's Second Symphony and they exude a gripping but noble lyricism - the dynamics in the third movement can be searing but they're not inappropriately so. The last disc is devoted to Franck. I don't suppose many would want too often to listen Gabriel Pierné's orchestration of the Prelude, Chorale and Fugue but I found it fascinating and quite moving. I'm sure Elgar did as well, at least the piano original, because I've seldom heard anything so redolently anticipatory of Elgar. His Redemption is surging and passionate and the Psyché Suite, which is frequently grave in spirit, rises to a passionate and beautifully shaped climax. As for the centrepiece of this disc, the Symphony in D, I can strongly recommend it as an interpretation every bit as good as his three commercial recordings. It's fiery and passionate, malleable and evocative, and conducted with the kind of eye and ear that Franck needs. All section principals are on excellent form and this is certainly, as a performance, more extrovertly etched than, say, the Chicago recording and certainly more obviously powerful and dramatic. Many of the smaller pieces are new to the Monteux discography, much of the Strauss and Wagner as well; of the remainder these are no mere ancillaries to his known recordings. Many are tighter and more emotive, more powerful and only a few poor performances intrude on the exceptionally high quality on display here. The sound as I say is generally good, exceptions noted, and the repertoire broad ranging despite the time limitations imposed on it. 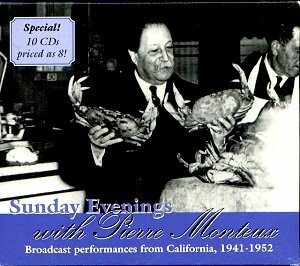 Twelve hours with Pierre Monteux is no time at all, so zestful, so clear, so deft his musicianship and so sympathetic his conducting. The ten CDs are priced as eight and, frankly, that's a bargain no admirer of Monteux and of great conducting could easily forego.